O'Gara and Wilson, Booksellers: Happy New Year! Let's talk about (historical) politics. Happy New Year! Let's talk about (historical) politics. Happy New Year, gentle readers. I've been thinking that I've been involved here at O'Gara & Wilson for a long time now. I don't work behind the counter anymore, but I'm so glad to stay involved by writing the blog that I started. It helps me keep in touch with our awesome staff and, of course, the Wilson family -- especially the gentle Doug Wilson, a bookstore owner with an artist's soul. And I also get to occasionally talk to our customers, too: you are all such an excellent lot of people. There is nothing like the book trade, and there are no people like people who love books. Anyways, I just needed a moment to get out all that mushy stuff. I, Lydia, hereby declare my undying love for O'Gara & Wilson. Hearts for everyone! 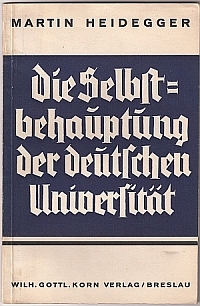 This is a genuine 1933 first edition of the philosopher Martin Heidegger's controversial "Rectorship Address" (in German). It was delivered after Heidegger officially joined the Nazi party and assumed the rectorship of Freiburg University. Our resident philosopher-employee Rory tells me that, "People still publish books about that rectorship address today." As this biography of Heidegger tells us: "Although he never claimed that his philosophy was concerned with politics, political considerations have come to overshadow his philosophical work." And the Nazi party was obviously reprehensible. But at the very least, this slim volume is valuable because Heidegger was a brilliant man who made significant contributions to the field of philosophy. And as a side note, I really like how German books print their text in awesomely gothic calligraphy-like type. $125.00 for calligraphy, philosophy, and controversy all in one small package! 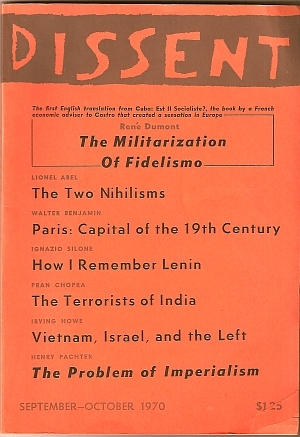 a quarterly magazine of politics and culture edited by Michael Kazin and Michael Walzer. 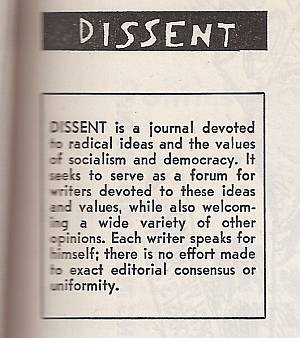 A magazine of the left, 'Dissent' is also one of independent minds and strong opinions. "A pillar of leftist intellectual provocation," writes the 'New York Times', Dissent is "devoted to slaying orthodoxies on the right and on the left." Adds historian John Patrick Diggins, "Dissent is kind of an anomaly... a magazine that's all heart and good hope." Founded in 1954 by a group of independent-minded radicals, the magazine set out to "dissent from the bleak atmosphere of conformism that pervades the political and intellectual life of the United States ...The accent of 'Dissent' will be radical. Its tradition will be the tradition of democratic socialism." Inspired by their opposition to both McCarthyism and communism, its early editors "wanted to speak for the spirit of democratic utopianism that runs like a bright thread through America's intellectual life." ... to the sympathetic-but-analytical article about Cuba's failing economy, this is very much an icon of its time and culture. And only $10.00 to boot! This week's Favorite isn't quite an icon of anything; it's too unusual. 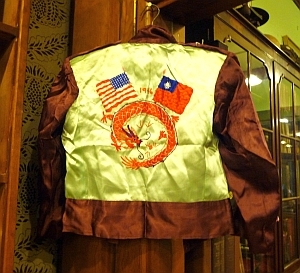 So basically, Chinese wives of American soldiers had many fewer problems getting into the country. This was right after the end of World War II, of course, and presumably soldiers were still steadily trickling home. 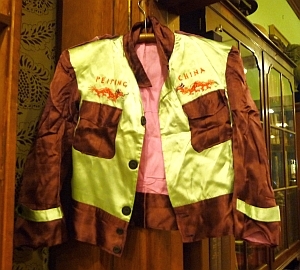 This jacket probably came with one of them, and is probably unique -- a bargain for $75.00. Thanks again for reading, folks. I'll try not to get too mushy, and wind up this entry in a calm manner. But seriously, I love this bookstore more than I can say! Happy New Year to everyone!